Loi Suites Resort in Puerto Iguazu - it's paradise located in the jungle near the Parque National Iguazu you do not know about yet. Well, we are back to the Loi Suites Hotel talking about the food although the following remarks are more general and apply to the whole country (certainly to Buenos Aires). - however if you like the beef in any form (specifically tenderloin called here Lomo) then you are in the right place :-). The hotel’s architecture is very impressive. The entry leads you to the nicely decorated lobby with a water-pool in the middle and a terrace. I think these words say it all! In other words you should be ready for the fact that Argentina's cuisine is almost "all about beef". Everything else did not get "traction" and sometimes may be disappointing. If you think that you saw swimming polls here then let's wait for the next page for you final words :-). From the left - the least expensive Junior Room. Agree- king size bed will be better than two beds together. Do you see this shower head? Two photos on the left: Individual villas with the jungle around and a private jacuzzi on the deck! 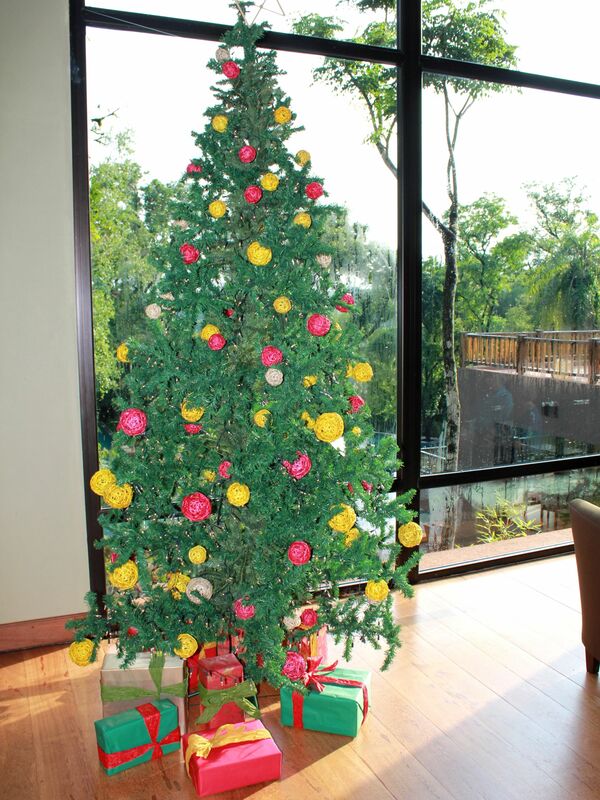 And if it happens that you visit the Iguazu Falls late December, this Christmas Tree in the Loi Suites hotel's lobby will remind you the Holiday. The whole complex was built with an extreme respect for the surrounding jungle, whenever possible preserving native trees. You will see them even in the middle of the infinity swimming pools which alone are spectacular as you will see in pictures on the next page. As a result the individual buildings are perfectly blending with the surrounding rain-forest. They are linked by suspended wooden bridges so when you walk over you have an impression of staying high up in the trees. Free access to the computers in the lobby gives you contacts with the whole world, although with the exception of family and friends you may want to reach when being here, everything else seems to be remote and unimportant. 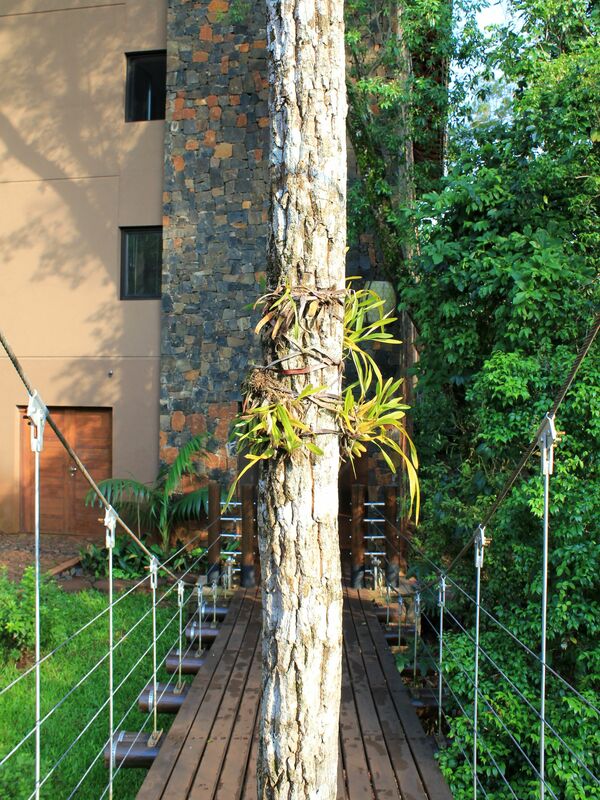 No wonder – this breathtaking rain-forest hotel thanks to its fabulous location and amenities is a little paradise. Once you are here an interest in anything else quickly fades out. BTW – there is also the computer center for children with I believe more content-restricting software. Rooms are well designed with large panoramic windows and balconies stretching out to the wilderness. If you wake up early morning you may see birds playing around (at least you can hear them). In each room you will find small fridge, safety deposit box, “quite” AC system (It always strikes me why in US most of these AC systems in hotels are so noisy!) and wired internet access. The bathroom is separated from the room by a window-wall so when in the bathtub you can still feel like in the middle of the jungle. (do not worry – you can cover the glass-wall if you do not like the jungle :-). The first day you walk to the lobby to check in, the hotel offers you a glass of fresh juice to make you feel like being home and welcomed. And honestly - given everything around certainly you have great chances to feel even better.